Davis declared for the 2012 NBA draft alongside the rest of the national championship team starting five: fellow freshmen Kidd-Gilchrist and Teague, and sophomores Jones and Doron Lamb. At the 2012 NBA Draft Combine, Davis measured at 6 feet 9.25 inches (2.06 m), 221.8 pounds (100.6 kg) and had the second longest wingspan—7 feet 5.5 inches (2.27 m) of any player participating. 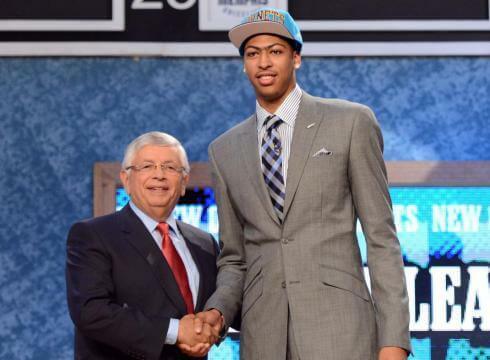 On June 28, the New Orleans Hornets selected Davis with the first overall pick. Davis became the fifth Chicago-area first overall selection following Cazzie Russell (1966), LaRue Martin (1972), Mark Aguirre (1981) and Derrick Rose (2008). On July 24, 2012, Davis signed a three-year $16 million guaranteed contract with the Hornets as prescribed by the NBA’s collective bargaining agreement.